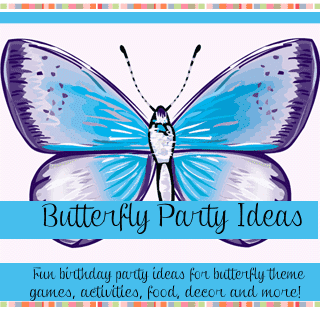 Mix and match these ideas to create your own special butterfly party. Send out butterfly shaped cards or plain white cards with butterfly stickers. For fun tie butterfly shaped cards (with party information) onto curling ribbon and attach to a helium balloon. The invitation will seem to “fly” below the helium balloon. Cut out large butterfly wings from colored paper and attach to Styrofoam bodies. Paint the bodies and add antennae and eyes - then hang from the ceiling with fishing line. On the birthday cake or present table cover the top of the table with a sunny yellow tablecloth. Make large colorful flower petals out of construction paper or poster board and then tape the petals around the outside of the table to make a flower. Add large artificial flowers all over the room (we’ve found super size flowers at the dollar store that were 12” wide). Blow up helium balloons and tie them with long strings of curling ribbon. Attach butterflies, dragonflies or any flying bug to the end of the curling ribbon. Let the balloons float to the ceiling and the butterflies	and bugs will “fly” around the party area. Gather or buy cheap colorful silk scarves and let the party guests pretend they are flying using them as wings. Set up a bubble blower and let them fly through the bubbles and pop them. Buy butterfly nets and plastic butterflies (check the dollar store). Hide the butterflies all over the backyard (or inside the house) and have a butterfly hunt. Let them keep the butterfly net and the butterflies they find. Variation: Hide special butterflies around the yard which will earn the finder a special prize. Before the party buy several small items to use as prizes and assign them a number. On several of the butterflies that are hidden write a number that corresponds with the prize number. When a child finds a butterfly with a number they get the prize that matches that number. You’ll need 2 - 3 rolls of new toilet paper for each team. Divide guests into teams of 3 to 4 players. Each team chooses who will be the caterpillar (the one who gets wrapped up). Give each team member - other then the caterpillar - a roll of toilet paper. The store bought game that has an elephant who blows out butterflies from his trunk. Kids try and catch the butterflies with their nets. Lots of fun for younger children. Make a list of 10 - 20 nature items that can be easily found outside and around the party area. Tell the teams that they are to try and find all the items on their list. The spoon and plastic baggie are for collecting bugs. Give them a time limit - 15 to 30 minutes depending on how long the list is. Print out the free list nature scavenger hunt list . The first team back with all the items on the list wins … or if time runs out the team that has the most items from the list wins. Give both teams a prize. Before making the butterfly scavenger hunt list go to the area and look around. Write down the things that you see and add them to your list. Take care to remove any potential dangers - ant mounds, poison ivy, etc. before the beginning of the party. Here are some things to look for: A feather, something blue, root, grass blade, seeds, wood, 3 different kinds of leaves, stick, something that makes noise, something that is faster (or slower) then a garden snail, something shiny, something white, something soft, something black. Play relay races and games but have them “fly” as they play the games. Make butterfly wings, or have them already pre-made or buy them and let the girls decorate the wings at the party. Buy wooden butterfly shapes at the craft store. Let the girls paint them with glittery paint of all colors, then when dry they can stick on jewels. Place a magnet strip on the back for a pretty refrigerator magnet. Bake cookies and cut them out with a butterfly cookie cutter. Let the guests decorate their butterflies with frosting, candies and writing gel. This can also take the place of a large cake. Make fun antennae with headbands, pipe cleaners and pompom balls. Let them take them home for a party favor. Fun Jell-O jigglers cut with a cookie cutter into butterfly shapes. Sandwiches cut with cookie cutters. Bow tie pasta - it looks like butterfly wings! Large Butterfly cookies - Cut cookies with a triangle cookie cutter and then place them together at the points of the triangle to make butterfly wings. Butterfly or flower shaped lip gloss kits. The butterfly wings, scarves or antennae can be given as the butterfly party favor. Pretty decorated butterfly shaped cookies tied in cellophane. Canvas totes decorated with butterflies. Squares of netting wrapped around the party favors and tied with a pretty ribbon always makes a fun goody bag.